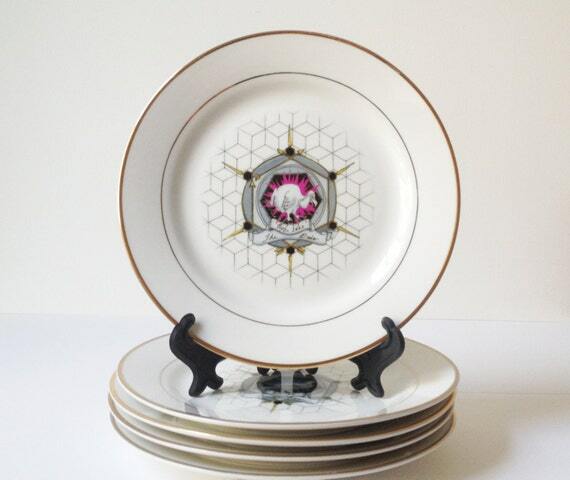 Last year I designed a set of commemorative plates honoring extinct animals. The most recent of the set is The Black African Rhino. Above the name I wrote Ext. 2011, the “Ext” for extinct is a play on historic plaques. That date is incorrect though. The Black African Rhino or Western Black Rhino actually went extinct in 2010, but was officially announced by the IUCN in 2011. Until I started this project, I didn’t know much about these animals or the circumstances of their extinction. I was really struck to find that in many instances, animals that were once abundant, were actually more likely to go extinct. For scientists, it seems that the specific details of each species and subspecies’ extinction are difficult to pin down (so to speak). After all, the Ivory-Billed Woodpecker continues to exist in this weird limbo between critically endangered, mythical, and possibly extinct. Seems like we only hear about the extinct species with names like “Martha,” the last Passenger Pigeon, or “Lonesome George,” the Galapagos Giant Tortoise, or the stories that accompany their struggle for survival like the Pyrenean Ibex. Maybe because the “last” in the case of the Black African Rhinoceros was not named, it’s not surprising that the news of its extinction made the rounds across social media this week with the groundbreaking headline that it had just become extinct. I think this says less about how we are terrible fact-checking pseudo-journalists and more about our alienation from the natural world. Maybe the take away is that people are genuinely saddened by the erosion of biodiversity. That’s a hopeful thought—that’s something we can build on.